The Wave, Muscat gave their Omani home fans something to cheer about on the penultimate day of the Extreme Sailing Series in Oman, finishing on the podium in seven out of eight races, to reclaim their place at the top of the leaderboard. Going into tomorrow’s final showdown just 16 points separating the top four boats. In seven knots of breeze and choppy seas – the remnants of the previous day's storm – the Austrian Red Bull Sailing Team maintained a consistent scoreline, including three race wins, adding an important 66 points to their tally, and elevating the team to third place – despite having to deal with the absence of skipper Roman Hagara, out with an elbow injury. Just shy of the podium by two points, Oman Air, with Olympic 49er sailor Stevie Morrison in the driving seat, is poised and ready to pounce – with a 30 point buffer over the chasing pack. Topping the bottom half of the leaderboard, Team Turx powered by Kaya Ropes had its best day of the season so far, with four fourth place finishes. 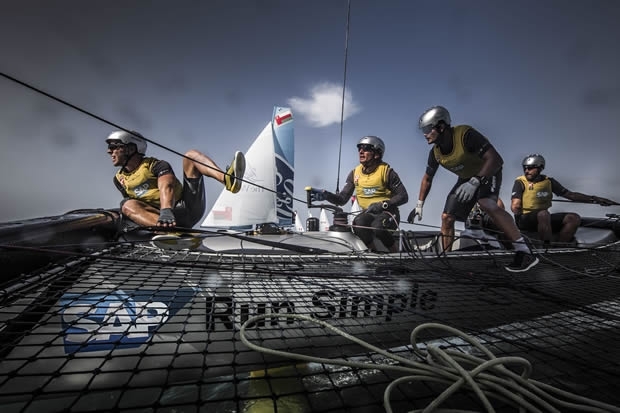 The fastest on the startline according to the SAP Sailing Analytics, the team is really starting to show its potential. GAC Pindar is just five points ahead of Lino Sonego Team Italia in sixth and seventh place respectively, while Gazprom Team Russia came out fighting, following yesterdays gear failure that saw them miss half a day of racing, posting a first, second and third in today's results. With the points so tight at the top and conditions set to get light and shifty, the results are far from determined at the Extreme Sailing Series Muscat. 1st The Wave, Muscat (OMA) Leigh McMillan, Sarah Ayton, Pete Greenhalgh, Ed Smyth, Nasser Al Mashari 176 points. 2nd SAP Extreme Sailing Team (DEN) Jes Gram-Hansen, Rasmus Køstner, Thierry Douillard, Mads Emil Stephensen, Brad Farrand 169 points. 3rd Red Bull Sailing Team (AUT) Hans Peter Steinacher, Jason Waterhouse, Adam Piggott,Shaun Mason, Stewart Dodson 162 points. 4th Oman Air (OMA) Stevie Morrison, Nic Asher, Ted Hackney, Ed Powys, Ali Al Balashi 160 points. 5th Team Turx powered by Kaya Ropes (TUR) Mitch Booth, Edhem Dirvana, Selim Kakış, Diogo Cayolla, Matteo Auguadro 128 points. 6th GAC Pindar (GBR) Seve Jarvin, Ian Williams, Marcus Ashley-Jones, Tyson Lamond, James Wierzbowski 121 points. 7th Lino Sonego Team Italia (ITA) Lorenzo Bressani, Enrico Zennaro, Gabriele Olivo, Tom Buggy, Stefano Ciampalini 116 points. 8th Gazprom Team Russia (RUS) Igor Lisovenko, Phil Robertson, Garth Ellingham, Alexander Bozhko, Aleksey Kulakov 100 points.